When we first launched our Kill Your TV program, we were excited to see how it would affect those who participated. We’ve been TV-free for several years, and our first months after ditching the tube were, to say the least, eye-opening. We had, like, SO MUCH TIME. To read. To exercise. To cook. To sleep (better). To connect with people we love. To live. We’ve long warned against the “Paleo-ification” of poor food choices (i.e. don’t recreate an overtly unhealthy food using “Paleo” ingredients in an attempt to label it “health food”). Not everyone loves that perspective, but in working with our consulting clients, thousands of Whole30 participants and hundreds of workshop attendees, we’ve found that most folks need this kind of concrete guideline to help them overcome the incredibly powerful and insidious influence that food (specifically sweets) has over them. See, our Whole30 program is designed to address both the physical and mental aspects of transitioning to a healthier eating plan, and that includes getting a handle on your cravings for and addictions to unhealthy things on a regular basis. The Whole30 eliminates potentially problematic food and drink in order to let your body recover from your old eating habits, and allow you to regain control over the food choices you make (instead of food hijacking your brain). After completing the program, many say, “I don’t really miss that crappy food anyway, so why would I go back to it after my Whole30?” We concur. However, there are some things that you probably do miss during the program – things you should be able to enjoy from time to time – which is why we don’t encourage people to stay Whole30 all year long. (We’re not actually killjoys, despite what some folks may think.) While it may be supremely healthy to perpetually eat “Whole30 clean” from a strictly physical basis, it’s likely to make you lose your marbles after a while. (We wrote about that here and here.) Chronically missing something incredibly delicious, culturally important or emotionally significant isn’t always mentally healthy, which is why we created the Whole9 Guide to Nutrional Off-Roading to help you navigate the mires of eating UnGood Food. Yes, we’re eventually coming back around to TV. We think about TV like dessert. And people, you don’t need more dessert. Seriously. Even if it’s “Paleo”. Desserts are not healthy everyday food, no matter what label you put on them. (Some folks get this – Chowstalker doesn’t do cupcakes, but has an awesome collection of “everyday” recipes, including tons of Whole30-compliant ones.) But, you ask, how bad can an after dinner coconut-milk-and-blueberry treat be, anyway? It’s surely better than ice cream, cookies or cake! Let’s now jump to this question… is Planet Earth, Rachel Ray, or the Iron Chef “less bad” than Sister Wives, American Idol or Jersey Shore? Maybe. But much like the “brownie” question above… that’s not the point. 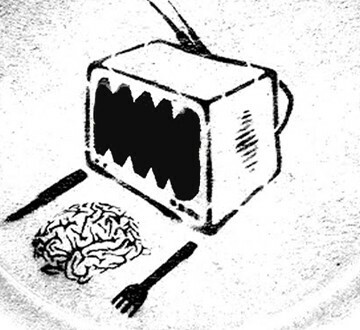 Much like sugar = sugar = sugar… TV = TV = TV. Some people would argue that the ongoing inclusion of small amounts of added sugar in , say, deli meat during your Whole30 isn’t going to continue to feed your Sugar Dragon. Maybe not – we sure don’t eat deli meat for the sweet taste. But gaining the awareness of how they sneak sugar into everything these days is a valuable process, and avoiding all forms of added sugar for 30 days builds a habit that helps keep your sugar cravings under control post-Whole30. Likewise, paying attention to how often you would casually flip on the TV “just for one show” might give you some insight into how much that insidious device pervades your life. Much like your coconut-milk-and-blueberries might make you crave other unhealthy sweets, that “just one show” might morph into a couple hours of TV-watching “down time” (read: your brain is not active). Or, worse, your screen time becomes an actual addiction… “just one show” at a time. So while the honey in deli turkey won’t create metabolic derangement, and watching Bobby Flay grill a rockin’ steak isn’t going to turn you into a drooling idiot, we think you can do better. And you can’t truly know how something (a food, a drink, a habit) is actually affecting you until you give it up for a little while. Once you’ve taken the 30 short days to learn how TV affects you – your stress levels, your relationship with your husband or your kids, your time management, your sleep, your mood – you might find that, like many Whole30ers, you are loving your new awareness (and health! ), and simply don’t want to go back to your old habits. Or you might decide that an occasional movie night or Dog Whisperer episode is a nice “treat”. Yes, like dessert. And we think that sounds pretty healthy, too. So if you’ve joined us for 30 TV-free days, props to you for being assertive with controlling your screen time. We think you’ll find the experience eye-opening, and perhaps just as influential as your Whole30. Drop a comment and let us know how it’s going, what you’re learning, and what lessons you hope to take forward with you after all is said and done. So far, I haven’t minded not watching TV very much. I did wish we could cuddle up on the couch and watch a movie on Saturday night, but whatever. The one thing I am noticing that I feel like I need to deal with is this: given no “zoning out” because the TV is off, I default to working. In the short term of this month, that’s kind of a good thing. I’m getting a ton of work done on my blog and future life. That’s very rewarding, but it’s not relaxing. I need to find a way to be pleasantly idle. So yes, turning off the TV for 30 days has been an eye-opener for me because I’m TERRIBLE at just relaxing or playing… without a purpose. Also, I meditated 5 times last week. It doesn’t seem to be changing me yet, but I’m in for the long haul. I don’t miss TV, per se – actually, I’ve long despised the rhythm of television, with the blaring commercials, vapid content, etc. I’m not a TV watcher anymore, even without artificial limits imposed, but I do miss movies – totally different rhythm, different experience, etc. And like you, Melicious, I find myself turning too often towards work/productivity rather than relaxation or active occupation with other tasks that don’t involve more computer time (and goodness knows, the last thing I need is more computer time!). I’m really trying to work on that one. I liked how you guys talked about not just having a relationship with the TV, but improving your relationships with others during this “NoTv30”, but as the lone TV-killer in my family, I’m finding this experience to be more isolating than connecting (with others, at least). I relate to what “Melicious” said above. I was actually a little stressed out at the end of the week because instead of TV, I worked more. Not in and of itself a bad thing, but I didn’t take those time that may have been filled with TV to actually unplug. During normal TV time I had to be busy with something else. Fortunately, this weekend I got into a good book and order several others to have on hand. Overall, much like when I made/make drastic changes to my diet, the first 3-4 days with no TV were a breeze. The last few days have been more difficult (thank God for awesome weather this last weekend), but I’ve found creative ways to start utilizing my time. I’m still on-board, and am even happier that I decided to take this challenge. So we have been following noTV30 as well. Unfortunately the Osama thing happened on May 1st and we did turn on the tv for an hour. We also watched TV for the Pacquiao fight but that was a social thing. we had people over at our house. I am getting a TON more sleep. We are also more present for our daughter. We are spending more time reading to her without feeling like we have to rush to fit in reading AND TV. That being said, I was a little bored this weekend and started a “to do” list. Whereas i do need to check out sometimes. We are already formulating a plan but we think we will cut TV out during the week period. It will be relegated to watching movies and football on the weekends. Great post. I’m joining you in the Kill Your TV challenge, and so far I haven’t really had too many issues. I have noticed I sleep MUCH better during the week without TV and I’m even spending less time online. It has turned pretty cold where I am, so it’s been a great excuse to go to bed really early and read. I haven’t needed the heater yet as a result. Double win! I’ve certainly found myself flopping down on the couch with remote in hand, only to realise that I hadn’t thought about what I was doing – it was just a habit. Kill Your TV has been awesome for making me much more aware of my TV habits. A few downsides, in addition to the same sort of issues that Melicious brought up – I have missed the ability to check youtube for exercise demonstrations, there have been a couple of instances where I’ve thought it would be really useful to sort my form out (now that I have more free time because I’ve ditched TV!) and check youtube – but sadly, it is out of the question for May. I also thought it would be an awesome time to do some yoga – but I don’t have easy access to classes and the DVDs are also out of the question. These are pretty minor, but after this is all over, I think I’ll maintain the no TV on school nights but allow for the use of exercise demos or DVDs. I absolutely support the intent of this challenge though and am feeling the benefits. Thanks for putting it out there! I’m not doing the no-TV May plan, mostly becasue TV/movies is really and truly not a problem for me (or my husband). I watch more now than I have in the past 20 years, and still it is only maybe twice a month for an hour. What is a much bigger problem for me is computer time. We did a whole family no-screens plan for the month of March and I now use the computer much less, but there is still so much I do on a computer. Having something in the middle ground is much harder than not doing it at all as I have to always be judging whether what I’m doing on the computer is worthy or not. I don’t do: FB, twitter, news, lots of yahoo groups, etc, but I do read a select few blogs/forums about nutrition/health, Thomas Jefferson Education (my kids are homeschooled) and my favorite non-profit (my passion). I need clear rules for when and how long and what I can do on the comptuer but I haven’t figured it out yet. Ideally I’d like to be able to get it all done in 30 min a day. But really that’s impossible. My email alone takes that amount of time often. Any advice out there from someone who has given up the computer almost totally? Really cool stuff during this time away from electronic distractions; highly recommended. I won’t lie when I say I’m looking forward to the challenge being over. I have watched a *little* TV when my parents were here for a week and when having dinner at a bar, but the hardest part was nixing YouTube and other online movies/clips. It is nice to throw on a movie and veg, but I enjoy the YouTube clips people post on Facebook or that go along with web articles. It’s okay that I missed the finale to DWTS, but music clips and cute videos (baby laughing in slow motion), while mindless, are entertaining. Additionally, while apt hunting, instead of pictures being posted, people will post a video tour of the house. Where do you draw the line? I happened to unplug the Tivo when looking for an outlet for my phone charger, so June won’t be spent catching up on my fave shows, but I do plan to go back and watch some videos friends posted and that were posted on CF. What I won’t do is turn on the TV for background noise and mindlessly veg. However, with the TV off, it has been awesome to hear our landlord in the house above (I live in a basement apt) and their kids arguing. And more than once I did reach for the remote to turn up the volume upstairs so i could hear them. Jen J: Where you draw the line is up to you. (Much like your food choices – what’s acceptable for you is going to be different than what I deem acceptable for me.) The point of the program is to increase awareness, and it sounds like it’s done just that for you. Not turning on the TV for background (or mindlessly consuming hours at a time) sounds like a fantastic start. If you find yourself slipping back into old habits, considering turning the TV off again just for a few days, to remind you of what you’re missing in your real life! Thanks for sharing your experience – we’d love to hear how your TV viewing habits have changed in another few weeks. I don’t see how going to church is a self improvement.